Completing your semi-formal outfit with a right accessory is essential to make an impressive style statement. Add this chic wallet to your collection of accessories which is exclusively presented by Titan to meet the style needs of young men. 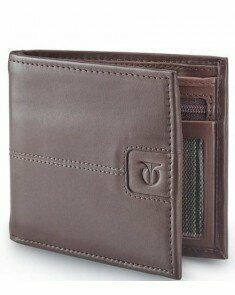 Ensuring an instant upgrade in your dressing sense, this black wallet is designed with stylish features. Made using the superior quality leather materials, this Titan Wallet - For Men with an ID pocket ensures long-lasting durability and great utility. You need not worry about your coins or currency notes slipping off as this smart wallet is bi-foldable designed with an extra detachable flap to ensure safe use. You can safely keep the loose coins in the coin pocket which comes with a zipper. There are nine credit card slots where you can keep all your credit and debit cards. In the photo holder and sim card holder, you can store your sim cards and photos.